Jack Clarke - Church Lads Brigade, pre 1910? Jack Clarke - Church Lads' Brigade, pre 1910? Jack was born in 1889 and looks to be aged 16 to 18 (may be older?) in the photo (see enlargement below), suggesting a date of around 1905 - 1908 or later. The military uniform includes a pillbox hat worn at a jaunty angle, white sashes worn over the right shoulder and three of the youths have a second, darker sash over their left shoulders. All wear a dark leather belt over trousers and jackets with metal buttons. 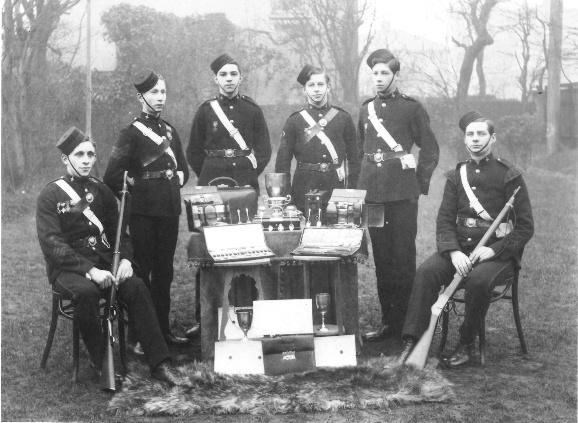 Two (may be three) youths carry a rifle and some have medals, badges and chevrons. Enlargement showing John May Clarke. 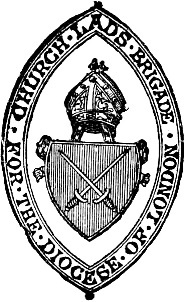 Thanks to Rob Bolton, Archivist, The Church Lads’ & Church Girls’ Brigade, January 2013 for providing all the following information and also the emblem at the end: 'The Photo you have is of members of ‘The London Diocesan Church Lads’ Brigade’ formed in 1891 at the same time as the ‘Church Lads’ Brigade’.